If using pre-made gravy, heat it in a deep skillet over medium heat until boiling. If you've made your own, transfer it to a deep skillet (if not already in one). Turn heat to medium low and add sliced turkey to gravy. Heat until turkey is warmed through. Place 1-2 slices of bread on plate and top with mashed potatoes. 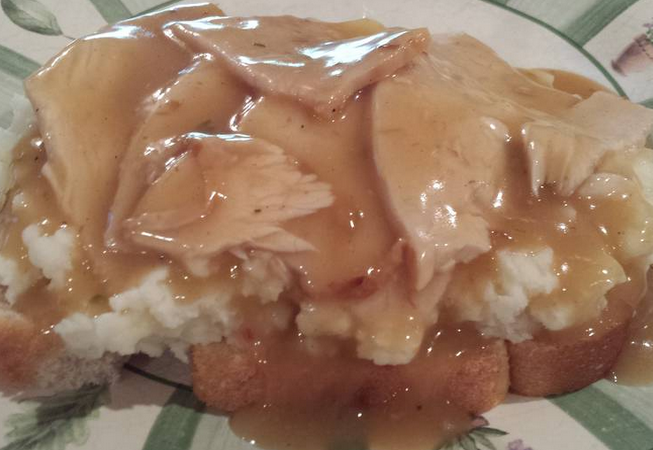 Place desired number of turkey slices on top of potatoes and cover with gravy. ** You can make your own mashed potatoes or use instant potato flakes (nice when in a hurry). ** You can use leftover turkey for this dish. But when leftovers aren't an option, just go to the deli and get sliced oven roasted turkey breast (I usually have them slice it at a 3). ** You can also make this dish with beef gravy and sliced roast beef. 0 Response to "Turkey Manhattan"